My friend Alan got married on 2/4/15 but I was on holiday in Ibiza, so I am seeing him on Sunday so thought I better pull my finger and make this card. The love die is from tattered lace, cut on centura pearl card. The stamped image is from the crafters companion swalk range and coloured with my spectrum noir pens. The flowers are made from a die which I got from rubyred crafts. The numbers and scroll are tattered lace dies, all stuck together with the best glue in the world colall. Black pearls, white heart and red ribbon from my old stash. 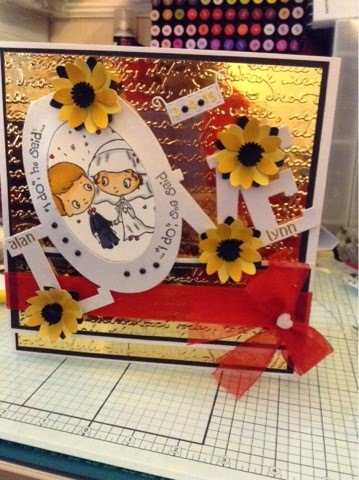 Gorgeous wedding card. Love the design. LOVE the LOVE card. Great job.